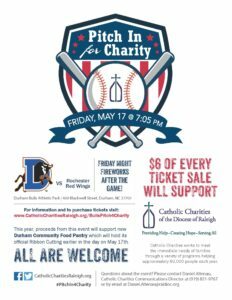 This summer we have teamed up with the Durham Bulls to host a Catholic Charities night at their game! This year, proceeds from the event will go to supporting the new Catholic Charities Durham Community Food Pantry, which will be holding its official Ribbon Cutting that afternoon. The game is an opportunity to take a break, catch a baseball game, and support Catholic Charities, all at the same time. See below for more information about the game. If you have further questions, please contact Daniel Altenau by email Daniel.Altenau@raldioc.org or (919) 821 – 9767. 50% of each ticket purchased through the Catholic Charities website will benefit the Durham Community Food Pantry.